Editor's note: Teachers are uniquely inspiring people. It takes a teacher to innovate in the classroom and inspire a love for learning. We had a great time celebrating these everyday heroes at ISTE this week, and we wanted to highlight a few of them below. Check out the #GoogleEdu and #ISTE2016 hashtags to get a recap of what went on in Denver this week. The teachers at Laguna Beach Unified School District in California and Sun Prairie Area School District in Wisconsin wanted to give their traditional classroom a reboot. By upending the typical classroom layout that confines students to desks and teachers to the front of the room, they increased student engagement, introducing technology, hands-on learning and group activities. “The classroom is the most neglected element in education right now,” says Mike Morrison, chief technology officer at Laguna Beach Unified School District. “You’ll find rooms with dark projectors, the lights out and the blinds drawn. How could these dark spaces inspire learning?” At Laguna Beach, Morrison and 15 teachers plunged into research on the impact that environment has on the senses — and tested technologies, furniture and even colored lighting. The core elements, says Morrison, boiled down to flexible furniture, multiple monitors and audio amplification. To replace bulky desks that were designed decades ago to be placed in rows, Morrison and his team chose desks and chairs with wheels that can revolve in any direction. This frees up teachers and students to quickly group desks together and direct attention at any part of the classroom — or at each other. There are standing desks as well, giving students the option to have their legs engaged — a boon for students dealing with attention-deficit disorders, Morrison says. More monitors and whiteboards provide more space for students to work as teams, instead of just watching the teacher up front. “The walls can then become anything we want them to be,” says Morrison — a place for a test review, a team project or solving a math problem as a class. Morrison and his team also changed the audio and lighting to help set the mood for different types of learning and make it easier for teachers to be heard. Teachers wear lanyard microphones connected to each classroom’s speaker system. “A teacher who spends the day shouting to be heard is stressed, and so is the class,” Morrison says. Teachers use lighting to change wall colors depending on the activity — yellow to encourage quiet reading time, blue for creativity and brainstorming. Laguna Beach Unified School district put together this fun video — a takeoff on TV’s “The Office” — showing off the classroom improvements. At Sun Prairie Area School District, teachers are inspiring students to be entrepreneurial and engage with technology. They found that by creating dedicated spaces without any of the usual trappings of a classroom, they could motivate students to break out of their comfort zones and think more outside the box. 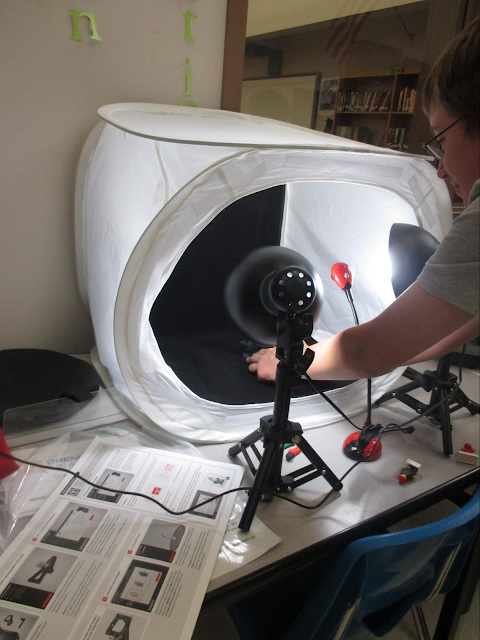 One of these learning spaces, “Fab Lab,” was created by Stephanie Breunig, a media specialist for the district’s Cardinal Heights Upper Middle School. Students can use the Fab Lab for school or personal projects. The lab has Legos, digital and GoPro cameras, art supplies, circuit boards and software such as GarageBand, recording software for music and Final Cut Pro, a video editing software. In the Fab Lab, students work with teachers to create their own videos or music mashups and internet memes. They've even started learning 3D printing and robotics. “Literacy no longer means just reading and writing words on a page. Technology has created a new definition of literacy that includes digital,” says Curt Mould, director of innovation, assessment and continuous improvement at Sun Prairie Area School District. To teach with technology, teachers are creating learning spaces defined by interactive learning and experimentation. Laguna Beach and Sun Prairie Area School Districts have discovered just a few of the ways that disrupting the traditional classroom environment can help engage students. From exploring the world with online activities, to simply taking the classroom outside for a lesson, there are an infinite number of ways that teachers all over are creating new learning spaces to inspire students. Is your school district trying to reinvent the rooms where learning happens? Tell us about your plans to inspire curiosity in the classroom environment.